Even now, thinking back on my experiences at Tokyo Disney Sea, I still can't get over how amazing the park is. There is such a richness in detail both from afar and up close, such grandeur in scale and scope, such hyper-realistic immersion... it is almost overwhelming. 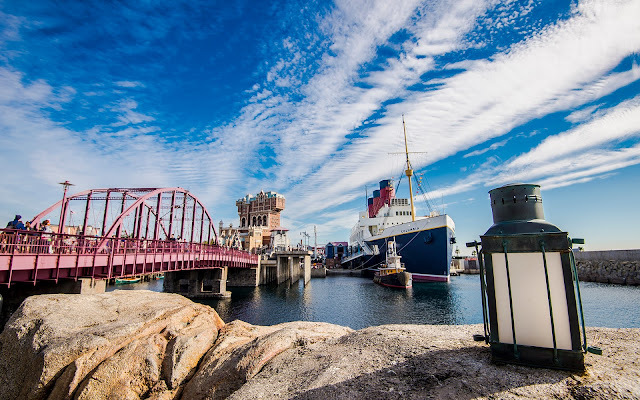 Tokyo Disney Sea is a photographer's dream, because pointing the camera anywhere yields a shot of something fantastic. In the American Waterfront, this especially holds true around the area of the S.S. Columbia and the Tower of Terror. The Tower of Terror is what happens when the Japanese get a hold of a rather simple facade and decide they want something more magnificent. So exit the California Spanish style and enter an intricate Moorish Revival style. And the Columbia? Nothing significant... it's just a restaurant and lounge... inside of a large scaled steamliner... that they built because they could. Tokyo Disney Sea is insane... insanely detailed and beautiful... and I can't wait to go back.